The Oomatono Tsunoten Shinto shrine in Inagi, Tokyo. The two main Japanese religions are Shinto (an animistic religion similar to (neo-)Paganism in the West) and Buddhism. A lot of anime action takes place in Shinto shrines (jinja) and Buddhist temples (tera). Series with a supernatural bent may be set there for part or all of their action. More light-hearted Slice of Life series may feature the characters attending a festival such as Hatsumode (New Year's), possibly as part of a Festival Episode. Famous shrines and temples are also good destinations for a Class Trip. You may or may not meet a miko at shrines. Shrines usually will also have shimenawa present. Ah! My Goddess: After he was expelled from the dorm for bringing a female there, Keiichi and the girls live in an old abandoned temple, which has fallen into disrepair, but was restored by Bell's magic. Blue Seed: The show's main heroine is a miko. Dennou Coil features a lot of them; the town the story is set in has a lot of old shrines, and the protagonists are often forced to seek refuge from trigger-happy antivirus program Satchii (who is forbidden from entering shrines and private homes) in them. A very significant alien hunt takes place at a Buddhist temple in Gantz. In Ghost in the Shell: Stand Alone Complex the prime minister visists a buddhist temple to meditate before a highly critical meeting, where she is attacked by a terrorist with a katana. Gingitsune centres around a local Inari shrine. It also visits several other local shrines and their guardians, including a jingū-ji, a small shrine that is part of larger Buddhist temple. The shrine of Oyashiro-sama in Higurashi: When They Cry is the venue for Watanagashi Festival, the major turning point in each story arc. It's also where two of the main characters live, and the social center of Hinamizawa ever since the dam protests brought the residents together for village meetings there. InuYasha often deals with temples, monks and priestesses, as Miroku is a Buddhist priest and Kikyo and Kaede are both mikos. Kagome actually lives in a shrine, and has miko powers, but isn't a miko yet. Kannagi, Nagi is a deity after all. Kurenai, the two main protoganists visit a festival at a shrine. The second Monster of the Week battle in Magical Girl Lyrical Nanoha takes place at the entrance of one. The Class Trip Arc of Mahou Sensei Negima! includes a visit to a famous temple complex in Kyoto, and Konoka's childhood home is yet another temple complex. There's also the Tatsumiya Shrine, which was used by Chao as the setting for the Tournament Arc of the Mahora Festival. Natsume of Natsume's Book of Friends learned to escape to temples when chased by youkai long before the story's start and several of the supernatural characters live at shrines. Worth noting: Neon Genesis Evangelion is notable for containing almost no references to Japan's native religion or the most popular imported one, with only two exceptions — a 108 reference that is quickly passed over, and a hilltop Shinto shrine that is almost demolished in an early episode. Nyan Koi! !, it's where all the fun with the cats started. In the Ouran High School Host Club manga the boys, Haruhi, and their new friend Mei all visit a temple for New Year's. Chapter 3 of 3-gatsu no Lion features Matsumoto praying at a Shinto shrine for victory in his match against Rei. Loudly. In Yotsuba&!, we get both. For the shrines, Jumbo takes Yotsuba and Ena cicada-catching at a local shrine, because of all the trees on the grounds make it a good hunting ground, and the girls later help pull a omikoshi (portable shrine) through the streets during a festival there. For the temples, Yotsuba's father uses a temple guardian statue to scare her after catching her lying one too many times. Touko form Touko no Jikenbo is a young priestess that struggles to keep the family shrine solvent. The girls from Tamayura like to hang out at some well-known temples in their hometown of Takehara, most notably Saihō-ji. Shrines and temples are seen and visited often in Ranma ½.
Futatsu no Spica, mostly through flashbacks. 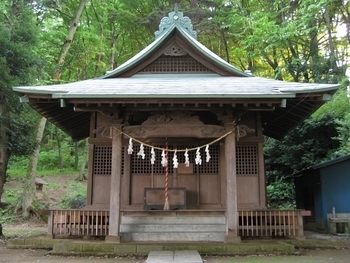 The main characters of Kamisama Kiss live in a Shinto Shrine. Its upkeep and shrine duties make up several plot points. In Death Note, Sayu complains bitterly when she's told to run an errand for her mother instead of attending hatsumode. Later, a large temple is built (or in the process of being built) to Kira. Light complains that it's too soon to be doing that. Oshou, The Captain's uncle in You're Under Arrest!, is an old Shinto priest (and a retired cop  Kachou's actually kinda inherited his precinct) who bombs around Sumida in an E.R.A. Mini Turbo and sometimes gives his nephew an advice, or simply shares a quiet moment with him on his shrine's veranda. In Cardcaptor Sakura, these become a plot point several times. Mostly, the Tsukimine Shrine, where Sakura's teacher works as a Miko part-time. In Noragami, these naturally feature as well. Yato crashes at someone else's shrine, and hopes to have an especially opulent one of his own someday. Being a Miko, Maori's stage in Arcana Heart is naturally the Shrine her family takes care of. The Hakurei and, later, Moriya shrines in Touhou. The Hakurei shrine is of particular importance: not only is it the home of one of the protagonists, but it also acts as a doorway into and out of Gensokyo. Reimu's so lazy about maintaining it that it's basically lost all of its holiness, though. And as of Undefined Fantastic Object, we can add Byakuren's Buddhist temple to the mix. On that note, Len'en features the Senri Shrine. Again, two of the protagonists live there, and the head priest's job is (amongst other things) maintaining the Mugenri Barrier. Interestingly, the shrine includes a laboratory for Tsubakura to do research in. No temples have shown up yet, but, given that JynX has said that Devanagara is predominantly Buddhist, and that Tenkai's spellcards contain references to Buddhist themes, we can assume one can show up soon. The Alaya Shrine plays a major role in the backstory of Persona 2: Innocent Sin; it's where the main cast all played together as children, as well as the site of the eponymous "innocent sin" that drives Joker's animosity against the party. The local shrine is an important location in Persona 3. You can boost your relationships and Knowledge there, it's where the New Year's Festival is held, and two Social Links hang out at its attached playground. It's also where the dog Kuromaru, one of your party members, used to live. Persona 4 features a run-down shrine that seems to be abandoned except for a surprisingly money-hungry fox who has you fulfill the prayers of people who visit in exchange for discounts on healing in the TV World. If you complete all the tasks you're given, the shrine gets lavishly redecorated, and turns out to be the spot where the fox raises her kits. Persona 5 has the Meiji Shrine, which lets you boost your relationships if you make an offering. In Age of Empires III the Japanese civilization can build Shrines, which provide their population, and produces resources. They also can build the Toshogu Shrine as their Wonder building. Phoenix Wright: Ace Attorney - Trials and Tribulations: At one point Phoenix and Maya visit Hazakura temple. Maya wants to train her powers as a spirit medium, while Phoenix wants to investigate one of the mikos, who seem to have connection to his past. Given the series they're in someone gets murdered when they visit.